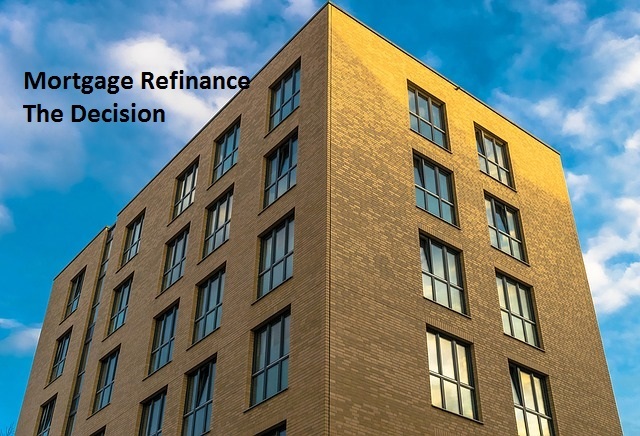 A little while back, I published an article about my private finance client who was grappling with a mortgage refinance decision on her commercial office building. The client is a retired widow in her mid 60’s whose husband passed away about three years ago. Previously, the client’s husband had entered into a floating 15-year mortgage in the amount of $2.7 million for an office building that housed his business. At the same time, he entered into an interest rate swap which essentially converted the mortgage from floating into a 6% fixed rate mortgage. Also recall that the combined structure had been entered into just prior to the 2008 housing crisis. During 2008, interest rates, and in this case specifically 1 month LIBOR dropped from a high of 4.57% when the agreement was executed to less than 1% by the end of the year. And the rate has not been above 1% since then. As such, the swap has been deeply underwater since inception. I was hired to analyze her options for refinancing the mortgage and/or swap. Similar to a number of you, my initial thought was that she should pay off the swap and refinance the mortgage. She could drop her interest rate from 6% to less 4%. It’s probably what I would do. But I’m not in the same stage of life as my client. I still have fairly significant expenses with kids in school, college, etc. Her kids are grown and long gone. Her expenses are relatively low. When I work as a consultant, it’s a natural tendency to put myself into the scenario I’m analyzing. But the most important part of a consulting engagement is listening to the client. Whether it’s an individual or a large company, don’t make the mistake of assuming you know what the client wants before listening to what they have to say. And sometimes, not only do you need to listen to what they say, but you need to listen to what they don’t say. In this case, I knew a little background on my client’s financial situation, but I hadn’t met her in person and didn’t know much beyond the numbers. She didn’t know what she wanted to do which is why she hired me. I had to listen to her story. I had to get inside her situation to help guide her decision. And in the end it was her decision. I could give her the facts. I could provide my guidance, but she needed to make the decision. So I went through the summary, gave her the facts, and we discussed. There were a few significant factors that came out of our discussion. Low income requirement. The client has a low monthly income requirement which is already being met by other sources. She does not require any proceeds from the building to pay for her living expenses. Incoming cash. Additionally, the client had approximately $300K in cash proceeds coming in within the next month. That money could be used to terminate the swap or it could be invested. Did not want to be a landlord. The client did not want to continue being a landlord. She did not like the responsibility for maintenance and dealing with the tenant issues that came up. Mortgage was coterminous with current lease. The current lease would expire at roughly the same time as the mortgage was due to be paid off. She was concerned about having debt on the building beyond the current lease term. Pretty quickly after we began the discussion, she decided that the mortgage refinance option was not something she wanted to pursue. She didn’t like that refinancing would extend the term of the mortgage another 7 or 8 years beyond the tenant lease. And when you looked at the mortgage separated from the swap, the terms were actually pretty good. At LIBOR plus 1.4%, the interest rate on the mortgage is currently less than 2%. She would not be able to get that low of a rate on a mortgage refinance. Based on these factors, the client was leaning toward either paying off the swap or keeping the existing arrangement in place. As we continued. I pointed out that over the course of the next year, if interest rates stayed where they are, she would pay $65K on the swap. Instead, she could opt to spend $287K today to terminate the swap. When she looked at spending $287K to essentially generate $65K, which equates to a greater than 22% return in one year, she decided that was the way to go. After going through everything, it was hard to argue with the logic. Rather than paying off the swap, you could invest the money in the market. But there is volatility in the market. And this is an even bigger deal for someone with a short time horizon like my client. Instead, she could earn a nearly guaranteed high rate of return by paying off the swap and re-establish a very attractive low interest rate mortgage for the remaining 7 years. Readers, what do you think about the mortgage refinance option now? Do you agree with her decision? Or would you still refinance? Having a less complicated financial life makes sense at that (and many ages). Thanks for doing this follow up for us. Spoken like a true Financial Slacker! Yeah I agree, seems like the right decision to terminate that swap. I’m surprised the bank sold a 15 year swap. I didn’t think that was common practice but maybe in recent years they’ve gotten away from that. Horrible timing to execute the swap, couldn’t get much worse than that. She’s making the best of a bad situation. Thanks for sharing. I assume they were comfortable with the swap because it was structured to exactly mirror the mortgage payments and the counter-party was affiliated with the mortgage lender. Also, the swap was secured with the property.